For the bot-aspirant autopiloters of highsec, the week of January 3rd @ 00:00 EVEtime through January 9th @ 23:59 EVEtime was a difficult one. Hundreds of billions of isk worth of contraband entered Uedama only to disappear in a puff of smoke. Though the game mechanics are stacked against us, the New Order has grown exceedingly efficient at ganking high-EHP targets. How efficient, you ask? BlahBlah6 didn't bother to wait for the gank to happen. loyalanon is so good at PvP that he can make jump freighters explode just by talking to them. Happy Tickle's jump freighter was gently tickled by a combination of antimatter and torpedoes until Happy Tickle was the only player involved who wasn't happy. Agents Velia Canus, Kristopher Rocancourt, Zahard Ignis, Gentaros, Ben Li, Josh Tsutola, Ryan Aego, loyalanon, Ryvarant, Placebo Sotken, Zuzu Aqua, Lissa Stonewall, Knackered Old Goat, Ghost Shell-Spice Zula Terra, and holdmybeer's destruction of the Rhea was interesting in another way: The top damage-getters inflicted exactly equal damage due to the torpedoes, so each time you load the kill in-game, you get them listed in a different order. 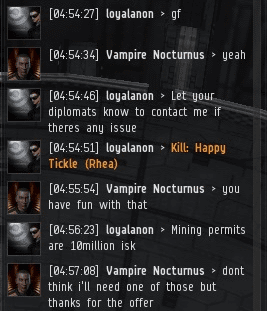 Happy Tickle's spokesalt, a member of the Imperium, attempted to stop the gank. He had about as much luck as a CODEdot freighter trying to travel safely through Imperium space. 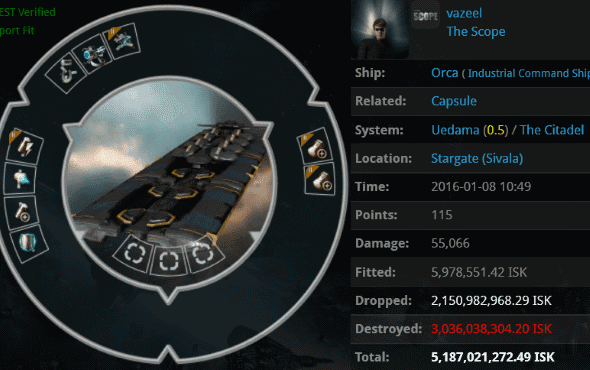 vazeel's failure to properly fit his Orca was only the beginning of his problems. The high value of his cargo soon attracted the attention of the New Order audit committee. Agents Sophia Soprano, 412nv Yaken, BAE B BLUE, loyalanon, karma balancer, reaper Shardani, and glaciale chasse were dispatched and promptly revoked the Orca's right to remain intact. Our Agents presented their conclusions in a zKillboard comment. It's hard to argue with their logic. They make governing highsec sound so simple! Hmmm... 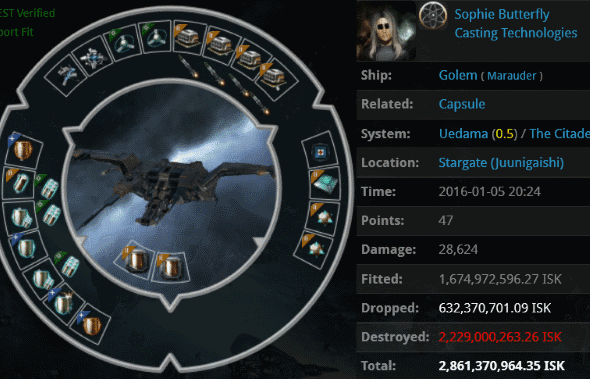 Remind me, Anti-Gankers: Would Sophie Butterfly's Golem qualify as a ship that "can shoot back"? Upon witnessing the beast lumbering through Uedama, the Kusion family felt that its honour had been violated. Code violators in their neck of the woods? They rustled up a few friends and took the rascally varmint to the woodshed. In other words, Agents Jason Kusion, Serena Stardust, Serena StormCrow, Logical Fallacy, Jayden Kusion, Hayley, Jake Kusion, Prixm Wind, Jayson Kusion, Joel Kusion, Jackson Kusion, Bob Painter, Justin Kusion, Nin Rin, Joseph Kusion, Yvain Bluewater, Joshua Kusion, Jeremiah Kusion, and Johnathan Kusion killed the Golem, along with its 900 million isk pod. 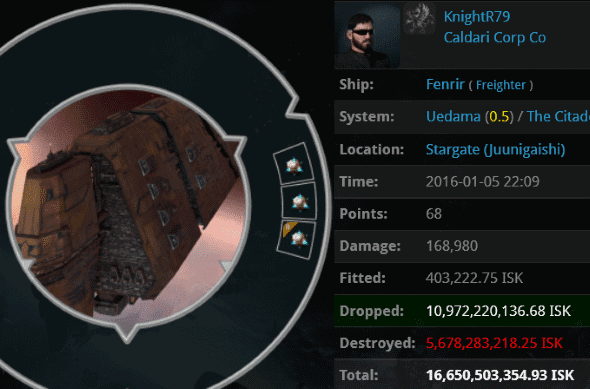 KnightR79 was quite a whale--over 16 billion isk, but zero sense. 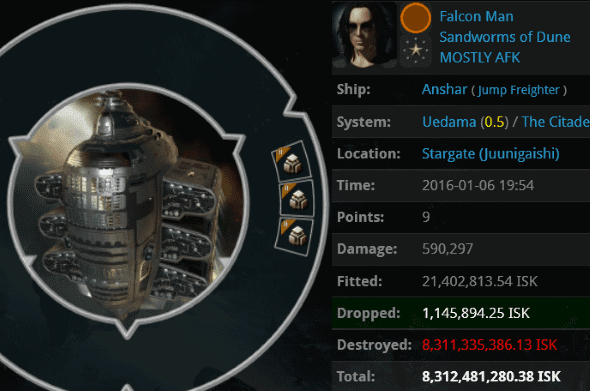 In nullsec, such a loss might result in a big headline on a slow news day. But in Uedama, it's just another day at the office. Agents Bob Painter, Nelli Alariel, Bratok Srayona, Engin Can, Schizz Popinov, AntiGanks TooStrong, Moogular, Justin Kusion, Jack Fizzleblade, Pure Whyte, Jayden Kusion, Jayson Kusion, Jake Kusion, Inspector Implant, Jackson Kusion, Joel Kusion, Joshua Kusion, Jeremiah Kusion, Jason Kusion, marcusluv stradius, Joseph Kusion, Matt18002, and Johnathan Kusion incinerated the freighter. KnightR79 was probably another one of those "I don't think I'll be needing a permit" types. What happens when the Kusions and the Cohenbergs get together? 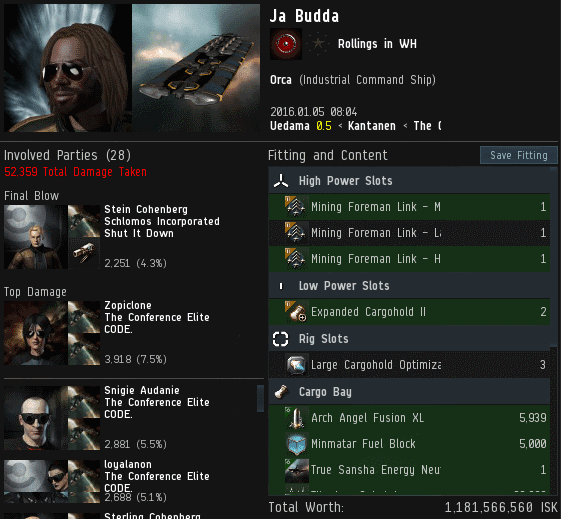 Ja Budda found out: Enough gankers to take down a Orca with nothing but Atrons. Agents Zopiclone, Snigie Audanie, loyalanon, Josh Tsutola, Sterling Cohenberg, Logical Fallacy, Hayley, Jason Kusion, Stein Cohenberg, Sherman Cohenberg, Justin Kusion, Jake Kusion, Yvain Bluewater, Nin Rin, Jayden Kusion, Jackson Kusion, Jayson Kusion, Jeremiah Kusion, Joel Kusion, Prixm Wind, Stanley Cohenberg, Silvester Cohenberg, Joseph Kusion, Johnathan Kusion, Joshua Kusion, 412nv Yaken, Greg Inglis, and PostOp Transexual proved that frigate fleets are still viable in the current meta. You know, we in the New Order often counsel the carebears to fit a proper tank on their ship. There are a lot of ways to tank up, but at the end of the day, there's no substitute for a good, solid permit tank. Falcon Man's triple-bulkheaded jump freighter absorbed 590,000 damage from a combination of Catalysts, stealth bombers, and Taloses. In the end, the Code won. There are no limits to what a group of determined, courageous men and women can accomplish. Kudos to Agents AntiGanks TooStrong, Jason Kusion, Lament von Gankenheim, Sophia Soprano, BAE B BLUE, Zopiclone, Salah ad-Din al-Jawahiri, Cheeky Nando, Rick Therapist, marcusluv stradius, Karmafleet Is Recruiting, Brutal Anna, Zula Terra, Krominal, Kristopher Rocancourt, Ben Li, loyalanon, Chocolate Mooses, Velia Canus, Gentaros, Zuzu Aqua, Zahard Ignis, Carebears' Nightmare, Justin Kusion, Runeme Shilter, Jake Kusion, Jayden Kusion, Joseph Kusion, Jeremiah Kusion, Joel Kusion, Ryan Aego, Johnathan Kusion, The Occidental, Joshua Kusion, Anya Rosa, Marina Gankalot, Shizz Popinov, Malpha Inanis, and Jackson Kusion. They helped make highsec safe for the Code this week. Another week of Victory for the New Order and the mighty Code Alliance. Another week of failure for Antiganking. Their failure is so magnanimous, I don't understand how they keep going! It must be so awful to be so not-really-committed to such a cause, but pretend to support it so fiercely in the face of such an Invincible opposing force like the New Order! Anti-Ganking just keeps on failing non-stop daily! The guy had so much faith in Anti-Ganking that he blew up his own ship. Such a delicious CODE victory. yawn...months later the same old garbage...and highsec much the same as always. The griefers can win some inconsequential battled, but they shall surely lose the war. 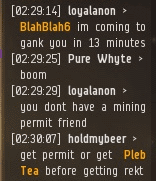 Get a permit or get rekt fool! Anti-Ganking, anti-ganking, anti-ganking! Why the obsession with Anti-Ganking? If they fail non-stop daily why talk about them always, 24-7? Is there an article where you don't mention AG? It is mentioned in this article and of the 3 agent comments all 3 are about AG! (not including the Veers comment who, as we all know, is just a NO alt used to stir up trouble in the AG channels). Truly aside from killing carebears you guys are obsessed with AG, almost to the point of fanboi-ness. Seriously, why the obsession? I'm not a NO alt, idiot. Because they fail nonstop daily and we like to remind them of this fact. Kind of like how the follow us around ingame. Watch us dunk freighters infront front of them and cry in local. why the obsession with failing to stop the ganks? Code is obsessed with winning while ag is obsessed with failing nonstop daily continously ALL the time!!! "BlahBlah6 didn't bother to wait for the gank to happen. loyalanon is so good at PvP that he can make jump freighters explode just by talking to them." "What happens when the Kusions and the Cohenbergs get together?" That must be a sight to see! I wonder what is so entertaining about destroying a defenseless ship? That said, Falcon Man's ship did follow the Code, you still killed him. So the Code fails, as it always must. 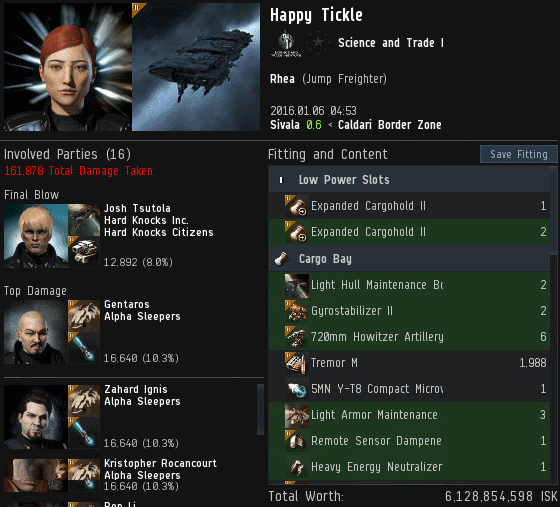 Finally, paying you 10M ISK is useless as you're just one group of pirates out of thousands. Failing to display a permit in the bio is still a violation of The Code, and therefore rendered Falcon Man's freighter a target for the loyal and honorable New Order Forces. Remember, "No Permit, No Freighter™!" Why don't you link some recent freighter suicide ganks that were NOT performed by CODE. Or Miniluv? But I thought we were just one among thousands?? ?